The use of kenaf has been extensively explored since its introduction in 1999 by the Malaysian government. 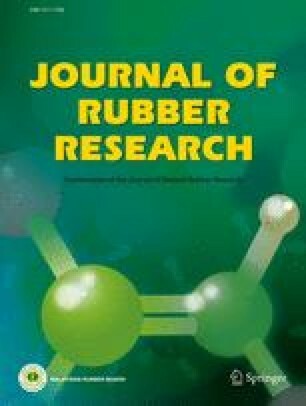 However, its lacking application in rubber latex motivates the present study on preparation of kenaf bast fibre dispersions for the latex based industry. The fibres were first dry ground using four stainless steel sieve rings with different trapezoidal perforated diameters. This was followed by treatment of the smallest fibres with various concentrations of potassium hydroxide (KOH). Upon optimisation of the KOH concentration, the fibres were ball milled for 56 h to further reduce its size. The resulting dispersions were characterised to obtain their diameter and distribution, zeta potential, pH, morphology and rheology, respectively. The dry grinding process significantly reduced fibre sizes and the highest reduction observed was 80 μm using the smallest (0.08 mm) stainless sieve ring. Treatment of these fibres with increasing concentrations of KOH resulted in darkening of fibre colour, increased separation of the fibre layers, improvement in zeta potential and reduction in flow properties. Ball milling the bast fibres contributed to a further reduction in fibre size, with those in water reducing from 80 μm to 5 μm and that of fibres in 20 wt% KOH reducing from 80 μm to 8 μm. Optical microscopy also showed well dispersed bast fibres after 56 h milling. Compared to the ball milled fibres in water, zeta potential and flow properties were higher for the ball milled fibres in 20 wt% KOH. Similarly, the maximum packing concentration (φp) of the bast fibres in 20 wt% KOH was also slightly higher with a φp of 13.11 wt% compared to the bast fibres dispersed in distilled water with a φp of 12.45 wt%.